It is generally known (back to medieval or ancient times) that deprivation of sensory stimuli like voice and vision in the early phases of human life will cause irreversible mental retardation in the child. Also the prevention of child play will cause intellectual deficits in the adult. But eyes, ears and the nose are not the only human sensory systems. Additionally there are the two body sensor systems, the "somatosensors". One is the vestibular sensor for maintaining orientation and upright walk. The other one is the skin, for sensing touch. Through the work of James W. Prescott, Ph.D. and various others until the mid 1970s it was established that these previously neglected senses are of overwhelming importance for the development of social abilities for adult life. 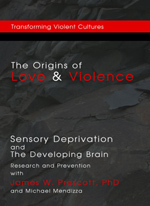 Their deprivation in childhood is a major cause for adult violence. James W. Prescott, Ph.D., was a health scientist administrator at the National Institute of Child Health and Human Development (NICHD), one of the Institutes of the US National Institutes of Health (NIH) from 1966 to 1980. He created and directed the Developmental Behavioral Biology Program at the NICHD where he initiated NICHD supported research programs that documented how the failure of "Mother Love" in infant monkeys adversely affected the biological development of their brains. These astonishing abnormal brain changes underlie the behaviors of depression, impulse dyscontrol and violence that result from mother-infant separations. 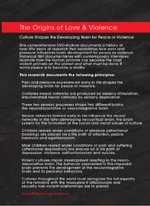 These behavioral effects were confirmed in his studies on primitive cultures including the effects of sensory deprivation of human sexual pleasure and affection during adolescence. The results of these scientific studies do not support the many traditional religious and cultural values throughout the world, which deny the importance of "Mothering" and of youth affectional sexual relationships for peaceful and loving behaviors. The continuation of this research was obstructed and eventually cancelled by the NICHD. Even the existence and results of these NICHD supported research programs was consciously omitted in a recent NIH publication. On this web site, you can read the whole story. Here you can read a short history of Dr. Prescott's research and the full text of the groundbreaking article "Body Pleasure and the Origins of Violence", watch the complete Time Life video documentary Rock A Bye Baby, browse the comprehensive archive of scientific papers and visit related websites from our list of selected links. See this page for information on how you can help out with and promote this website. Many of the ideas presented on this website are discussed in further detail on PEACELIST, a mailing list dedicated to peace education and research. You can subscribe to PEACELIST by entering your e-mail address in the form below and pressing the Subscribe button. Erik Möller, Joel Schlosberg and colleagues, 1998-2017. This is a collaborative project; if you want to help, feel free to join peacelist-tech, a mailing list which is dedicated to organizing all work (proofreading digitized documents, HTML, images etc.). Please mail me in case you find any errors on these pages. Cover illustration is a composition of the following paintings (from left to right): Pierre Auguste Renoir (1841-1919), Dance in the Town (for touch and movement); William Adolphe Bouguereau (1825-1905), The First Kiss (for intimate touch and sexuality); Mary Cassat (1844-1926), Mother and Child (for breast feeding and mother bonding). The small images are explained if you click on them. This Fight Sexual Mutilation WebRing site is owned by Erik Möller.